The Teacher Friendly Guide to the Evolution of Maize is designed to provide teachers with background information necessary to teach the concept of evolution. It is not a curriculum, rather it is meant to provide background information and ideas to support existing curricula. Links to resources that provide evolution curricula and activities can be found in the General Resources section. One way evolution can be understood is by studying crop domestication. Diversity and evolution are crucial for crop improvement. The incredible genetic variation available within maize gives it the potential for many uses and adaptation to many environments. Natural diversity and human intervention both play a role in crop evolution and domestication. 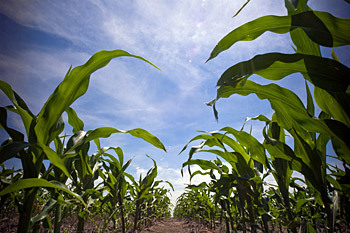 Maize lends itself extremely well for use as an educational tool, and particularly to an integrated education approach. Scientifically, maize is one of the best examples of crop domestication and an excellent visual example of genetic inheritance. Due to its large size and fast growth, it is a good demonstration of the plant life cycle, and is also a good example of agricultural techniques such as intercropping. Maize can be used in education on many levels; while an elementary school child can learn about food and plants from growing maize in the school garden, a college student can use maize to study genetic diversity. Maize has played an important role throughout history and in many cultures, most particularly that of Native American and Meso-American peoples. Finally, Barbara McClintock's fame as a woman scientist makes maize a wonderful example of the impact of women in science. This guide is an outreach component of an NSF-funded project (grant #0820619, "Genetic Architecture of Maize and Teosinte") and was developed in conjunction with a traveling science museum exhibit "Maize: Mysteries of an Ancient Grain." Fulton, T.M., Buckler, C.S., Kissel, R.A. 2011. The Teacher-Friendly Guide to the Evolution of Maize. Paleontological Research Institution, Ithaca, NY.